The South Central Planning, Exercise & Training Region needed a way to make emergency preparedness more enjoyable. Sounds crazy, right? But luckily for them, IdeaBank knew just how to cut out the 'doom and gloom.' We developed the 'Be Ready Nebraska' campaign; a program aimed at building preparedness skills in fun and empowering way. The projects we were tasked with completing included designing a logo, developing a website and producing a public service announcement. These materials were used to promote the program within a 15-county area in Central Nebraska. We started with the identity, crafting a logo that emphasizes the feeling of empowerment that comes from being prepared for an emergency situation. The shield shape used in the mark is representative of safety and protection. The colors inside the shield reflect the different types of disasters a person may face: earth, water/wind or fire. Those colors come together to form the shape of a person with their arms raised, indicating the person is ready for a disaster or emergency situation. The website (bereadynebraska.com) was designed to instill a feeling of confidence as it provides easy-to-use emergency planning tools and resources, highlighted by friendly graphics and photography. We divided the content by audience (families, farmers, business owners and so on), presenting visitors with a clear path to the information most relevant to them. A sense of community is created with the ability for people to submit stories about how they built a kit, created a plan, or made it through a disaster. Built with our gearsCMS, this site allows the client team to maintain content, edit features on the homepage, and manage the story submissions - making them active with one-click publishing. The site is mobile-friendly, with customized for smartphones and tablets. To publicize the launch of the website, we produced a 30-second PSA for air in the areas served by Be Ready Nebraska. The spot shows the tablet-friendly design of the site, showcasing the features with a hand guiding viewers through the touchscreen interface. The narration is read by a "mom" and is meant to resonant with one of our primary target audiences. 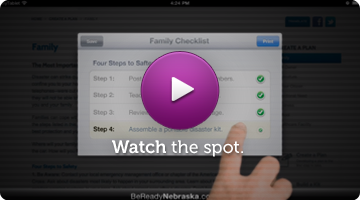 The spot highlights how quick and convenient it is to prepare a family for disasters and emergency situations using the tools on BeReadyNebraska.com.